With the fifth Dutch Lily Days coming into view, its organisation announced a change. The week will be shifted in 2015 to June 2 – 5. This is the organisation’s response to the wish expressed by many visitors to be able to see flowering Orientals as well. Another advantage is that the Flower Trials are held a week later, and foreign visitors can now combine their visit to both events. The fifth Dutch Lily Days builds on the successful formula first introduced in 2011. 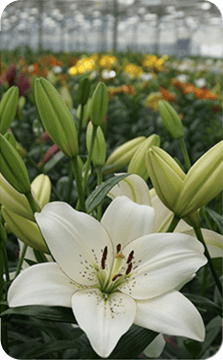 Now sixteen lily breeders and exporters open their doors for four successive days. This formula makes it easier for customers and other business relations to obtain a complete picture of the lily varieties all at once. And more and more people are taking advantage of that opportunity. Visitors plan it in their calendars as soon as the dates are announced. The interest from abroad has also been growing consistently over the four years. 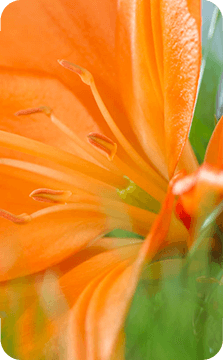 This year the Dutch Lily Days have moved to another spot on the calendar. The choice for June 2 – 5 means that flowering Orientals will also be on view, which was a wish expressed by many visitors. In earlier years the programming was arranged too early for this late-flowering lily group. It also benefits our international business relations as they can combine it with a visit to the annual Flower Trials. 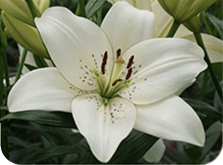 The participants in the fifth edition of the Dutch Lily Days are: Van den Bos Flower­bulbs, De Jong Lilys, Bot Flowerbulbs, Laan Flora Facilities, Lily Company, Mak Breeding, Marklily, Onings Holland Flowerbulbs, The Originals, C. Steenvoorden BV, G.A. Verdegaal, Gebr. Vletter & Den Haan, VWS Flowerbulbs, World Breeding, Zabo Plant and Royal Van Zanten.